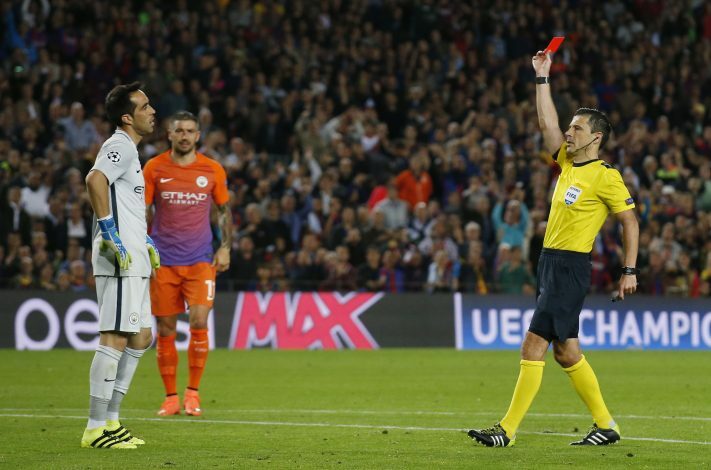 Manchester City goalkeeper Claudio Bravo wants a return to FC Barcelona, as he struggles to adjust with life at Manchester. Claudio Bravo joined Manchester City from Barcelona this summer for a fee of £15.4 million. But four months after signing for City, Bravo is struggling with his form, and wants a return to his old club. Manchester City boss Pep Guardiola bought the Chilean goalkeeper as replacement for the axed Joe Hart. Pep wanted a goalkeeper who could do more with the ball at his feet. As soon Claudio arrived at City, Joe Hart was loaned out to an Italian side Torino in Serie A. But Bravo has struggled to find his form at City, and has kept just four clean sheets so far. Moreover, the goalkeeper, who can hardly speak English, hasn’t adjusted to life at his new club. He now wants a return to former club FC Barcelona, despite the fact that the Spanish side has 2 other quality goalkeepers in the likes of Marc-Andre Ter Stegen and Jasper Cillessen. According to Spanish news outlet Don Balon, Bravo told his former teammates about his difficulties in English football. Therefore, he would even consider being a back-up goalkeeper at Barcelona. The report adds that Bravo regrets his decision to leave Barca, and would really like to return to Spain. In addition, he is said to have difficulties in adjusting with the Mancunian culture and climate. Manchester City faced Leicester City last week, and the reigning Champions went on to win the match in some style. The result handed over another headache for Bravo, as Leicester scored a total of 4 goals in that match. If his poor form continues, there will soon be calls for City backup Willy Caballero to replace Claudio Bravo.